Bali Zoo Park is most favourite zoo park with popular zoo activities program owned, located at Singapadu village - Gianyar. This tourist attractions frequently visited by a large number of tourists both domestic, foreigners and local visitors when enjoy bali holiday tour packages. ...where you can learn about behavior more than 450 rare and exotic animals in a natural environment, with lush tropical atmosphere. this place is also a park where you can participate in adventure activities of interesting animals. "Mr. ANAK AGUNG GDE PUTRA", who has a great desire in history of bali zoo park formation. especially for young generations and tourists who come to visit this place. Sinyulong (freshwater crocodile) and varieties birds as well as many other interesting species. ...with moment bright colors chosen represent beautiful feeling color experienced by tourists when visit Bali Zoo Park. Turquoise colour symbolizes friendly feeling of refreshing to the tourists when having a bond with animals and nature around. Orange color is a picture of energy, adventure, happiness, charm and enthusiasm experience in Bali zoo park. While green color chosen as solid compliment, freshness identity natural atmosphere. supported with the existence of shade trees in an area altitude about 250 meters - 300 meters above sea level. so as to have the atmosphere of fresh weather at night. that often traversed by tourists which located at Singapadu's highway - Banjar Seseh - Desa Batuan - Singapadu sub-district - Gianyar regency - Bali - Indonesia. ...because this zoo is situated in an area that close to all famous tourist access point, also affordable to all types vehicles. Bali Zoo Park also has a spacious parking which is surrounded by tropical shade trees. 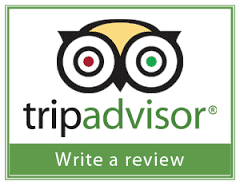 or around 1 hour from Kuta, Canggu, Seminyak and Nusa Dua beach area. If taken from Ubud art village or Ubud monkey forest can be reached about 20 minutes. Last schedule check-in at Bali Zoo Park is at 5:00 PM. And normal schedule Bali Zoo Park open every day at 09:00 AM, and closed on Nyepi Day (Balinese New Year). 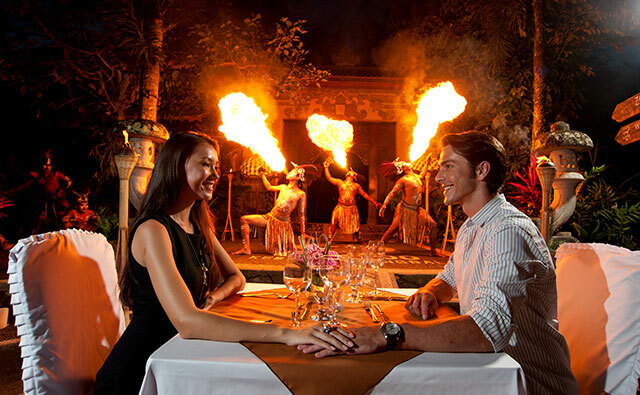 Detailed information Bali Zoo Park packages, please read: "Best Program Bali Zoo Park Packages"
In accordance with restaurant's name located at Bali zoo park is "WANA RESTAURANT", (Balinese language) which means "Restaurant in the forest". Wana restaurant is a fine dining restaurant, also a lounge bar (a place for you to relax) when you do a holiday visit in Bali zoo park. ...and designed with an uniquely rustic interior ambience, as well as all existing furniture made by local craftsmen. Chicken spices, Tuna, Squid salad, Soto pesmol, Duck and Galangan kare, Tart tatin, brown lava, Yellow pickled fish or Bali platter. 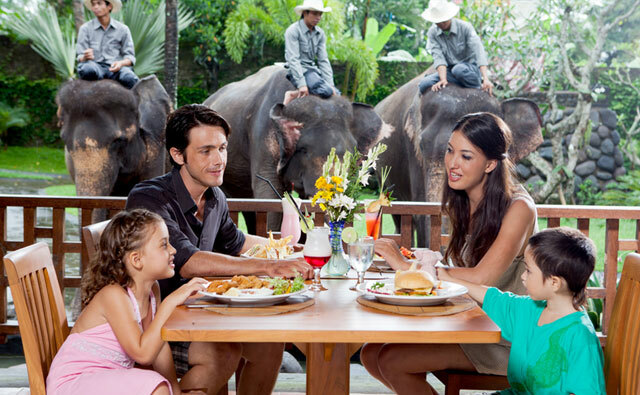 So a visit to Bali zoo while enjoying meal in wild life atmosphere will be a memorable experience. Wana restaurant is open from 9:00 AM until 5:00 PM. Beside Wana restaurants, bali zoo park also provides a very pleasant place and amazing miniapolis jungle water park (Jungle Splash). ...while swimming after takes a day adventure in Bali zoo. So your children will have a very enjoyable time playing in Miniapolis jungle waterpark with parents and families. So that will make your holiday atmosphere will be really more complete, and impressive. Miniapolis jungle waterplay operational schedule start opened at 10:00 AM until 5:00 PM. or also for large tourism buses who visits this place. ...so it will create a comfortable situation for you when parked your vehicles. 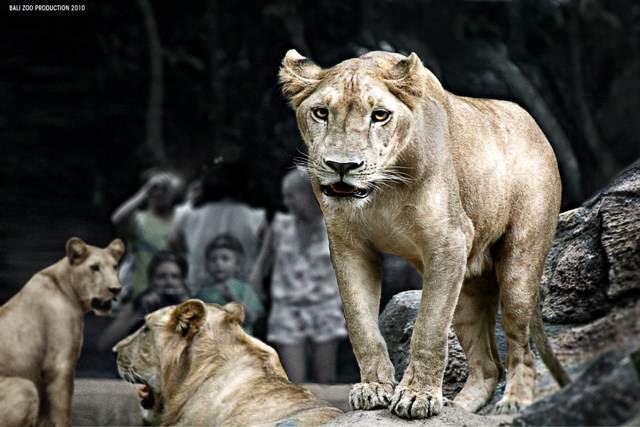 Bali zoo park also provides more than 450 rare and exotic animals that are in a very lush natural tropical environment. Sumatran bengal tiger, Sumatran elephants, Binturong, Sinyulong, Orang-utan, sun bear, reptiles, birds and other tropical animals else. So for you would really can feel how held an adventure in middle of wild animals in a renowned place of Bali zoo park. Bali Zoo Park is best bali zoo with famous zoo park packages that highly recommended by Sorga Bali Tours (Online organizer for holidays, Adventure packages and Bali tour service activities).